Having a grab bar in your bathroom can enhance the overall safety of your space, especially as we age. It can be just the help you need to get in and out of the shower or to use the toilet, without the fear of falling.. There are plenty of companies that make grab bars for your bathroom. Not surprisingly, Moen is one of them. The company has been around since 1956 and has been an industry leader in bathroom fixtures ever since. If it’s a brand you trust and purchase, then it will very well be the one you turn to when it comes time to consider grab bars for your bathroom. We have compiled the seven best options with the Moen name. 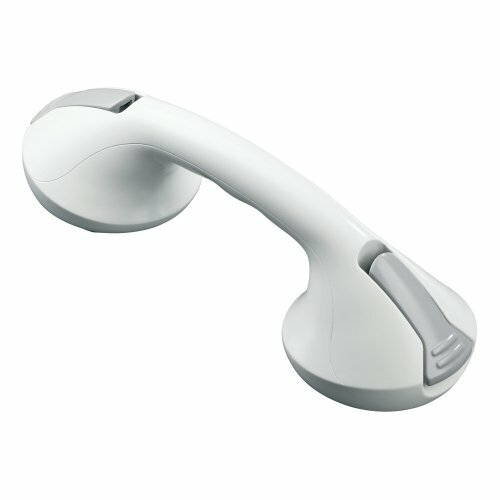 Uses suction allowing you to move it around the shower or tub with ease. The Moen 12-Inch Suction Bath Grip is a flexible option for the bathtub or shower. The purpose of this grip is to help you with your balance. You should not use it to help pull yourself in or out of the tub, it isn’t made to withstand total body weight. It’s made out of a polypropylene material, which is similar to plastic, so it won’t rust or corrode from constant exposure to water. The grip is textured so the plastic doesn’t become slick when your hands are wet. This bar doesn’t require any holes in your wall to mount, since it uses suction cups to stick in place. This also makes it easy to move or adjust, if you need to. You’ll just have to make sure the surface you’re attaching it to is flat and dry before you suction it to it. Extra-long to cover larger spaces. The Moen 24-Inch Grab Bar is a great choice if you need a longer bar and have the wall space for it. It comes in several finishes and colors to make it easy to match your bathroom fixtures and décor. Like most bathroom grab bars, it can be installed at any angle and is most effective and safest when the screws are mounted directly in the bathroom wall studs. Short enough for small shower stalls and bathroom areas. 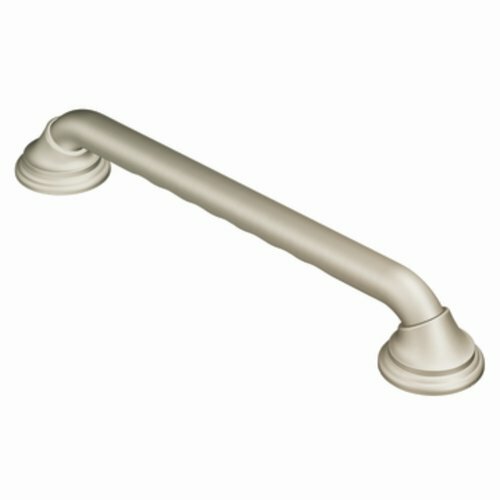 The Moen 12-Inch Designer Bathroom Grab Bar is small, making it a good choice when you are working with a small space. It’s also a good choice if you have enough strength that you don’t need to use both hands for balance. Holds toilet paper and provides grab bar functionality. The Moen Grab Bar Toilet Paper Holder is a two in one grab bar. You can use it for support and a toilet paper holder. This feature also saves space because you will have your grab bar and toilet paper in a single area. It installs fairly easily into a stud in the wall near the toilet. Grab on for safety and use the shelf to hold essential hygiene products. 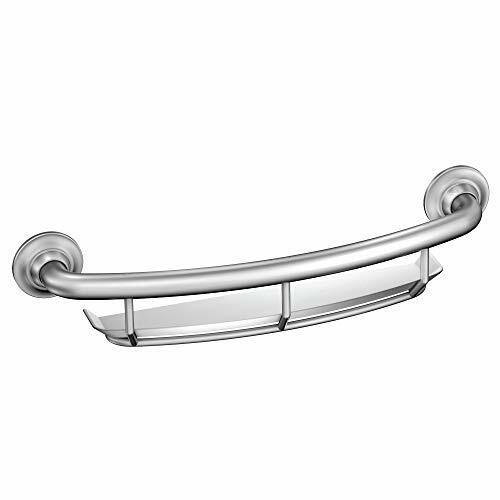 The Moen 16-Inch Grab Bar with Shelf is a flexible choice that offers both greater bathroom safety and storage. The grab bar can be used for support to stand up or sit down, while the shelf can be used for necessary bathroom products – everything from soap to shampoo. It’s a great option if you have limited wall space. This bar is stainless steel so it won’t rust, and the bar is curved which can make it easier to grab onto and allows more space for your hands.. There are two SecureMount anchors that come with this grab bar. You can add them with the screws into the studs in your wall for extra stability. Covers go over the top of the anchors to hide the installation and give it a more finished look. Installs quickly with its SecureMount design. 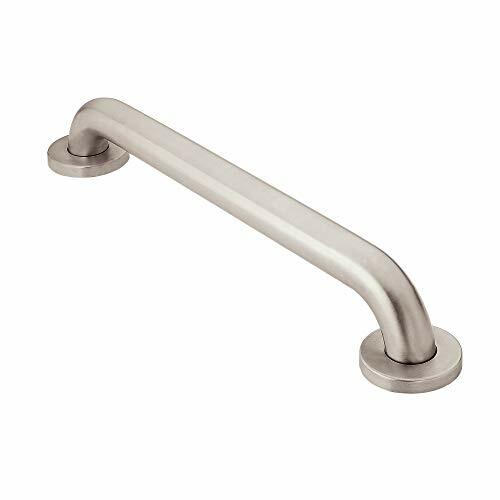 The Moen 18-Inch Bathroom Grab Bar doesn’t corrode because it’s made of stainless steel . Whether your hands are dry or wet, you can grab onto the bar securely. The diameter of the bar allows proper grip no matter your hand size. This bar is easy to install. Each side only needs two screws to secure into the studs in your wall. Once the screws are in place, you can quickly secure them with the covers that come with this bar. Typical installation as easy to install and most compatible. 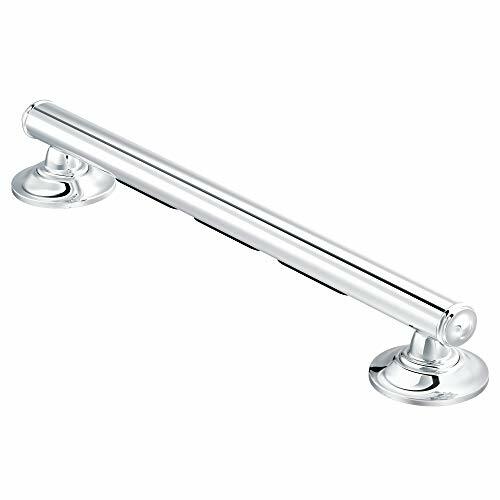 The Moen 16-Inch Bathroom Grab Bar features a simple design and a relatively standard size. 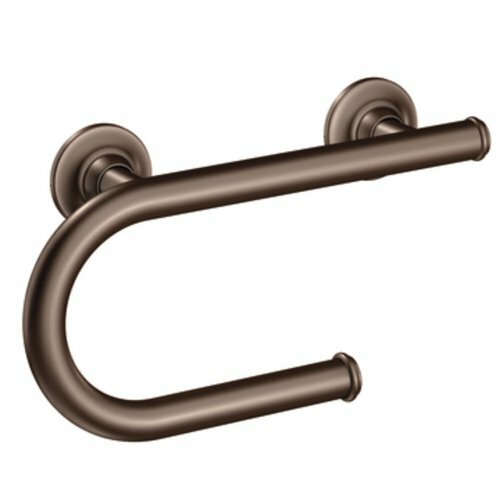 Moen touts a SecureMount design with all of its grab bars, but it doesn’t come with them. The SecureMount is an extra purchase but should be considered for the safety and stability it provides. Most grab bars can be installed vertically, horizontally and diagonally and should be mounted with screws into your bathroom wall studs. This Moen grab bar is no different. If you need to use it in several places, one that you can move easily might be a good choice. No matter the cost, when you’re a senior, you still have a budget to consider. Aside the from price of the product, there are several things to consider to ensure you make the right choice in grab bars. You’ll want to make sure you buy the right size. It can be frustrating to get something home and find out it’s too big or too small for the space. Measure your wall space in your bathroom before you go shopping to make sure you get the right length grab bar. You’ll also want to make sure the grab bar you choose can support your weight. Some grab bars can support more weight than others. The last thing you want is for it come out of the wall because it wasn’t sturdy enough..
For a smaller space, a grab bar that serves more than one purpose can be beneficial. If you have a small bathroom, you may need a grab that also functions as a toilet paper holder or towel rack. 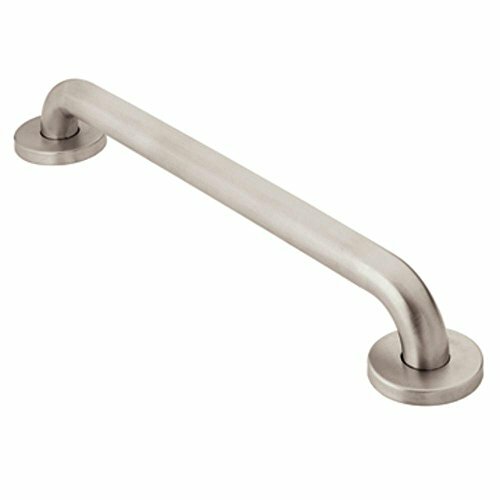 Grab bars are sleeker and more stylish than they’ve ever been but be sure and buy one that can withstand the moisture of a bathroom. Look for grab bars that are made of stainless steel or aluminum and won’t rust. You don’t want something that’s going to be hard to install, because you may never install it and that could put your safety at risk. Look for a grab bar that isn’t complicated to install and if it appears to be, ask at the store where you are purchasing if they offer installation. It’s important that the grab bar be comfortable to you. If you have arthritis or other joint problems, you may want to try different angles to make sure using it is easy and doesn’t hurt. Make sure your hand fits all the way around the bar and there’s space between it and the wall. That will ensure maximum grip and safety. Moen is a quality brand. It’s often the choice for many homebuilders when picking bathroom fixtures for their new construction. The grab bars the company makes is no different, they are generally of high and reliable quality. It should be a brand you consider when looking for grab bars to help you to continue to age in place.